E.A.T. South is looking for special volunteers to help staff our Good Food Day field trip program. If you enjoy working with young people, are enthusiastic about plants, gardening, outdoors, bees, and are available one weekday morning a month, this might be the volunteer job for you. Check out the job description below. Happy Good Food Day volunteers. Job Summary: E.A.T. South is seeking volunteers to help facilitate our interactive farm field trip program, Good Food Day. During Good Food Day field trips students learn about plants, pollinators, chickens, and farm ecology, gain hands-on experience with farm tasks and enjoy an amazing day outside on our beautiful farm. E.A.T. 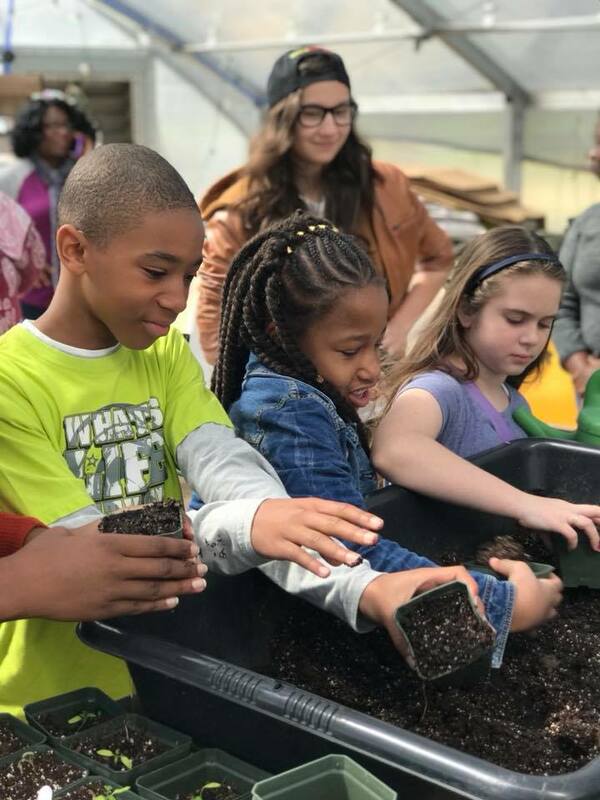 South is a nonprofit urban teaching farm in downtown Montgomery, Alabama, that engages our community by gathering around, learning about and growing good food. We empower people to change the way food travels from the ground to our plates. Responsibilities: Good Food Day field trips are approximately two hours long. Volunteers assist with setting up the field trip stations and activities and teach or co-teach one learning station during a field trip. Learning stations include but are not limited to bees and pollinators, chickens, plant parts, healthy food and cooking, and seeds. Content and hands-on projects vary by age group, and training is provided. Requirements: Volunteers should have an interest in outdoor education, good food, farming or gardening and be excited to share information with young people. Field trips are outside and on weekday mornings between the hours of 8:30 am and 12 pm. Volunteers must be available for at least one weekday morning a month. Volunteers able to commit to more than one morning a month are preferred. Volunteers must pass a background check and attend a volunteer training. Ongoing educational opportunities are also provided. Benefits: Volunteers enjoy sharing their enthusiasm for food, gardening or the outdoors with young people. All of our volunteers benefit from meeting new people in the community, engaging with their community in a unique and beautiful setting and also glean nutritional benefit by taking home items such as freshly picked vegetables, eggs and plants for their home gardens. Students potting up plants during Good Food Day. For university students, working in a garden education program is an asset to the resume of anyone interested in teaching. E.A.T. South will work with professors to arrange for credit where possible. Volunteering is a time commitment. Our field trips typically take place weekday mornings. If you have room in your schedule for us, we would love to have you on board! Contact: Please call 334-422-9331 or email the Good Food Day Coordinator, Amanda Edwards, Goodfoodday@eatsouth.org. We look forward to speaking with you. See You at Seedy Saturday!